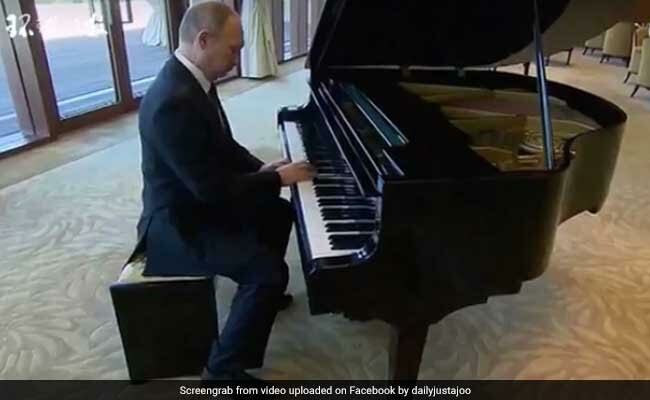 Russian President Vladimir Putin churned out some old Soviet-era tunes on the Piano as he waited for talks with Chinese President Xi Jinping. Beijing: Russian President Vladimir Putin played piano while awaiting Chinese leader Xi Jinping for bilateral talks in Beijing on Sunday. Putin spoke earlier on Sunday at a summit on China's new Silk Road plan. He later arrived at state Diaoyutai residence for talks with Xi and other leaders. While waiting for his bilateral talk with Xi to begin, Putin played several chords. According to TASS news agency and state Russian television, Putin played passages from Soviet-era songs about Moscow and St Petersburg. The 64-year-old former KGB spy has demonstrated his skills on the piano in the past although he has mostly cultivated a macho image. That included riding a horse in Siberia, piloting firefighting planes and diving in submersible into the depths of Lake Baikal and Black Sea off Crimea coast.